Americans are searching for healthy food. The FDA is working on its guidelines for what foods can claim to be “healthy” since it had to backtrack with the makers of Kind Bars. Delving into this issue, the New York Times reports some significant gaps between what nutrition experts think is healthy and what the public thinks. Number one on the list of foods that the public wonders about is sushi. When people ask, is a food healthy, most often they are asking about sushi, says the Times. Three quarters of nutrition professionals say it is. Less than half (49%) of the public agrees. This entire subject explains a lot about why confusion reigns in the realm of nutrition. Marion Nestle has it exactly right when she says, “Health claims are about marketing. They are not about health.” Calling a food “healthy” only serves to encourage people to eat more of it, which in turn can lead to unhealthy overconsumption. 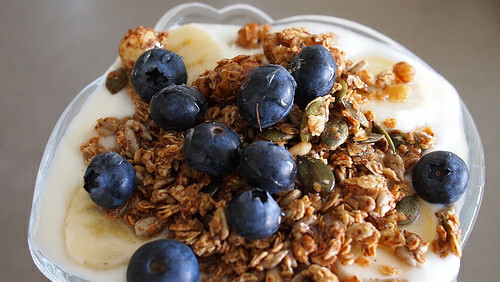 The public is convinced that granola, coconut oil, and frozen yogurt are all healthy. Nutrition experts mostly think they’re not. Both groups think that chocolate chip cookies are among the least healthy of foods. Diet soda, hamburgers, beef jerky, and white bread are keeping those cookies company on the list of foods that everybody thinks are bad. It’s this kind of thinking that has otherwise sensible scientists running around screaming that sugar is toxic. It might sell books, but it’s not particularly enlightening. An excess of sugar, or hamburgers, or white bread, or even blueberries might bring health problems. But food is food, not a medicine or a toxin. What matters is not any single food, but the total sum of what we eat. When a single food gets labeled as especially good, healthful, or desirable, we run the risk of letting it dominate our diets and take us away from good health. Health claims for food are nonsense. Click here and here for reporting from the Times on what the public and nutrition professionals think is healthy. Click here and here for the data from their surveys of the public. Click here for the data from their survey of nutrition experts. Quaker Healthy Granola Quinoa Bars have 10 different kinds of sugar listed as ingredients. There is ho scenario under which this is healthy, and yet they are allowed to get away with it. The FDA makes rules. The food companies find loopholes. Correct, Al. Health claims for food are nonsense. This post reinforces your July 8th observations on the perpetuation of nutrition myths. Total diet, not one or two individual ingredients or foods, is the tenet that can be supported by the body of evidence. I agree with Mr. Baker. I often give the example of nuts to my clients to drive this point home. The marketing of nuts has been a bit misleading as people are definitely overconsuming nuts these days. Nuts ARE healthy for you and are not off-limits when you are striving to consume a healthy diet. The operative phrase here is ‘healthy diet’. This implies a combination of foods that are wholesome and containing nutrients and substances that can help the body function and thrive as best as possible, according to the needs of the body relative to one’s lifestyle, environment, perhaps genetic disposition, I am constantly pointing out serving sizes, actual nutritional values, and overconsumption scenarios when trying to help folks get perspective on ‘healthy foods’ (nuts and seeds, nutritional bars, whole grains, frozen yogurts, lean meats, etc. )and the reality of the strengths and ‘limitations’ of their benefits to health. The new food labelling with bold-lettered corrected serving sizes and calories and sugars is a start but falls far short of more responsible positioning and marketing of proffered ‘healthy’ items on our shelves. Companies need to help out a lot more when it comes to presenting how their items can be PART of a healthy diet and not intrinsically healthy, which is a fallacy. Look at kale. Overconsumption of kale could be fatal to a person with a predisposition to blood clots or who is actually on blood thinners. Many companies own and manufacture various brands and types of foods and beverages. So, according to the marketing practices now used, for every granola bar or box of Oats that Quaker says is ‘healthy’, PepsiCo needs to blast just as loudly on their Cheetos and other chips, ‘unhealthy’. The food&beverage watchdogs and sugar police have done the job already about soft drinks, as we all know.